Brussels sprouts’ transformation from maligned cafeteria gross-out fare to foodie luminary is complete. Trendy New York restaurants gussy them up with pig fat and sell them by the tiny $8 plateful; David Chang’s Brussels sprouts at New York’s Momofuku were so popular he had to take them off the menu for his cooks’ well-being. Popular food bloggers Ree Drummond (“absolutely to die for”), Deb Perelman (“I love those tiny cabbage-heads”), and Heidi Swanson (“it’s not unusual for us to cook them … two or three times a week”) have sworn their allegiance. “I love Brussels sprouts,” shout T-shirts, bumper stickers, and baseball caps. Making Brussels sprouts delicious requires the usual suspects for making things delicious: fat, salt, and good timing. Fat is necessary less for its flavor than for its browning and crisping properties—without it, your Brussels sprouts will never be golden, crunchy, and gently caramelized. Salt is obviously a universal flavor enhancer, but it’s especially necessary to balance out Brussels sprouts’ inherent sweetness. And timing is more important for sprouts than for many other vegetables: You need to get them both 1) fully tender, but not mushy, and 2) deeply browned, but not charcoal-like. My suggestion: soy-roasted Brussels sprouts, which might be called, more accurately, soy-baked-and-then-roasted Brussels sprouts. Start by trimming the sprouts, which means taking off the stem with a paring knife (you’ll lose a few leaves, but don’t sweat it), and then halving them (the cut sides will absorb flavors better than the impervious exterior of whole sprouts). Toss them with peanut oil, soy sauce, and mustard, which adds a little electrifying punch, much like Jade Castrinos’ voice vis-à-vis Edward Sharpe and the Magnetic Zeros. Then throw them in the oven—first at a moderate temperature, to allow them to soak in the soy sauce and soften, and then at a higher temperature to crisp them up. Some of the stray leaves will shrivel and turn almost black; this is unavoidable, and you can still eat them if you don’t mind the burnt flavor. The intact halves will be permeated with soy sauce, easy to pierce with a fork, and patchily browned on the surface. Do they warrant public declarations of their to-die-for-ness? No. But they quietly live up to the hype. Heat the oven to 350°F and lightly grease a 13- by 18-inch baking sheet. Toss the Brussels sprouts with the peanut oil, soy sauce, mustard, and a little black pepper. Transfer to the greased baking sheet in an even layer and roast until the sprouts are partially tender, about 15 minutes. Stir and raise the oven temperature to 400°F. 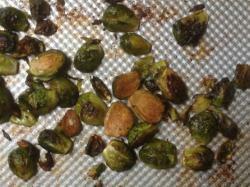 Continue to roast, stirring every 5 minutes or so, until the sprouts are browned and fully tender, 15 to 20 minutes. Serve hot or warm.